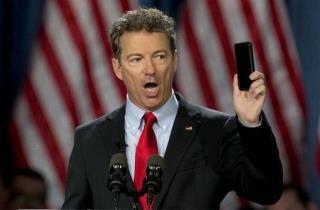 (Newser) – Rand Paul spoke for nearly 11 hours yesterday against the Patriot Act and NSA surveillance programs, but the senator didn't hold the Senate floor alone—seven Democrats and three other Republicans, including Ted Cruz, took the floor at times, Politico reports. The House has passed a measure to reform the Patriot Act, but Senate GOP leaders want to renew it without changes, the Guardian reports. "There comes a time in the history of nations when fear and complacency allow power to accumulate and liberty and privacy to suffer. That time is now and I will not let the Patriot Act, the most unpatriotic of acts, go unchallenged," Paul said at the start of his remarks, per CNN. Considering the people who want to replace it, what do they want to replace it with; they never say. This is just a stunt to convince people to allow it to go through just to get the crackpots out of the way. They are going to vote for it anyway. When the whole act is dropped then I will believe in the system. So to confirm the sincerity of Rand Paul's current position on the Patriot Act... What has he publicly said about the republican legislators that created it and the republican president that signed it into law? Rand's Kentucky Congressional Brother called the "Patriot Act... one of the most important and overdue pieces of legislation in a generation." ~Mitch McConnell~ Without citing and questioning the people who made it and applauded it as they signed it into law, Rand Paul seems completely disingenuous about not liking the Patriot Act today.